Take Me Tomorrow | Live. Laugh. Read. I would like to thank Shannon A. Thompson for providing me with an ARC (Advanced Reader Copy) of this book in exchange for an honest review. While I loved this book, I do admit that it was confusing at times (hence the .5). It took me a while to fully grasp the concept of how the drug tomo was the symbol of hope for the oppressed. I came to the conclusion that it was because it made you see that tomorrow would come. There was a line in the book that said the tomo showed peace after the war – which got me slightly confused because I thought that it only showed what tomorrow would bring – not any farther into the future. However, tomo is based largely on interpretation – so that could be part of it. A very unique story, Take Me Tomorrow had great characters that you couldn’t help but love (aside from those such as Phelps and Anthony/Tony which are the obvious enemies). Sophia isn’t one to mess with and, even when she was in the dark, you could count on her to stick up for her friends and put up a fight. I loved her knives and how she wasn’t afraid to use them – I’ve always been partial to knife-throwing. In the opening scene, we really see her relationship with her dog, Argos, and how she finds freedom in the forest behind her house. I love how her nickname isn’t just “Sophie” but “Soph E”. Sophia’s such a pretty name ;). Noah was an intriguing character. At first I, like Sophia, thought that he was a bad guy (government propaganda and all that). Luckily for us Noah fans out there, he’s not the one at fault here. However, the fact remains that he’s a tomo addict and I’m not quite sure how I feel about that other than gladness that here we have an obviously imperfect lead guy in fiction – which is surprisingly hard to find. I do believe though, his addiction isn’t that hard to believe and is perhaps even expected considering who his parents are. Despite his addiction, I do love Noah and it was rather amusing how he interacted with all the characters on an individual level. I love those watches!! At first, when we’re introduced to Broden in the hospital, we learn about his watch and his strange habits – constantly checking the time even though the face is broken and the time’s completely wrong, etc. Sophia then makes the remark that Noah was the same watch, but black. I think nothing of it. However, as we go deeper into the story we learn just how cool these watches are – Broden, Miles and Noah each have one and it’s how they communicate (it acts like a walkie talkie kind of thing), the watches are in sync at the “wrong time” so they can meet at times unknown to others and the last epic thing that we see these watches do is unlock Noah’s house – pretty awesome, huh? The latter quality leads me to wonder – how many are there? Is it a family thing? A rebellion item for key members? Are they hand-me-downs? What else can these watches do? Back to the characters now, Miles and Brody were really cool (I know what you’re thinking – if they’re so cool then why did you group them together? The real question however, is why not group them together?) Miles turned out to be super smart – after all, he stole a train as a pre-teen, how awesome is that?! I feel really sorry for Brody. First, he gets in a fight for which there’s word that he has to go back to military school (after only two years of freedom). Then, he gets himself arrested. Poor thing… In the beginning, he also tries really hard not to get Sophia involved in the whole tomo/illegal activity they’re got going on. Which, as you know by the synopsis, doesn’t work out too well. Let’s talk about Dwayne Grey (otherwise known as Sophia’s father). I loved his character so much! While he was out of town a lot, when he appeared he was just the best! Teaching his daughter to throw knives, hiding a forgery in his basement and – this one’s the best – being hired to work for Phelps (the evil dictator dude) on the account of being caught crossing illegally – in other words, for being a criminal. Yep, doesn’t this dude sound like the best dad? Well, he was despite and probably because of hiding a huge part of his life that was only unearthed when Noah came to town. Lyn was really cool. With her tattoos, nursing skills, baby bump and three-year-old son, she was the backbone to this odd group. Easy going despite her tough exterior, Lyn was the one to go to in a crisis – particularly if you needed something to aid in illegal activity. She was the getaway driver, nurse and motherly figure that kept them all in line. All in all, a great story with awesome characters who had each other’s backs in a unique dystopian world. 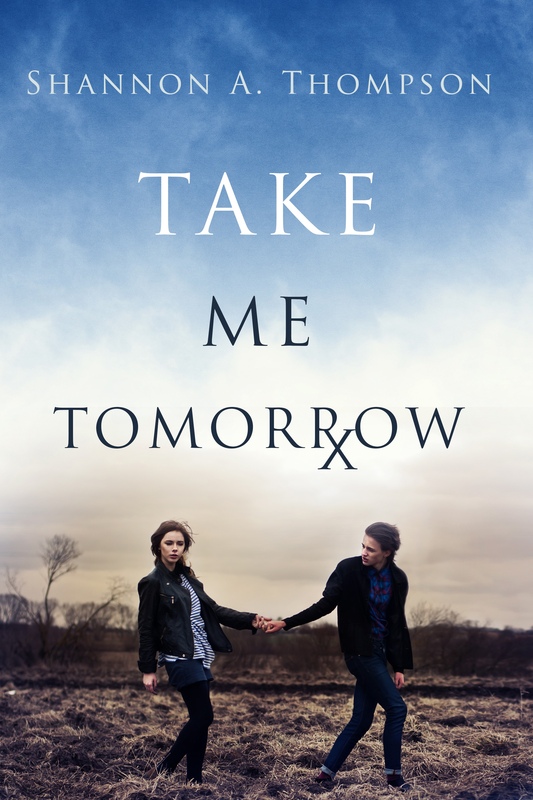 I highly recommend Take Me Tomorrow to those seeking an interesting read with characters that you can love and a plot line that twists and turns. I was wondering if you still accept review requests? I have a YA paranormal novel I’d love to chat with you about, if you’re interested. You can reach me at clmannarino@hotmail.com Thanks!